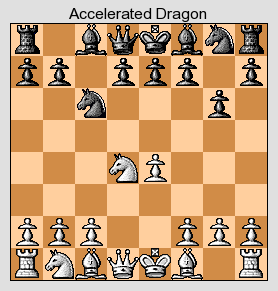 Like the standard Dragon Variation, Black develops his bishop to g7 in the Accelerated Dragon. The difference is that Black avoids playing ...d7-d6, so that he can later play ...d7-d5 in one move if possible. For example, if White tries to play in the style of the Yugoslav Attack with 5.Nc3 Bg7 6.Be3 Nf6 7.f3 0-0 8.Qd2, 8...d5! equalizes immediately. When White does play 5.Nc3, it is usually with the idea of continuing 5...Bg7 6.Be3 Nf6 7.Bc4 0-0 8.Bb3 (forestalling any tricks involving ...Nxe4 and ...d5), followed by kingside castling. 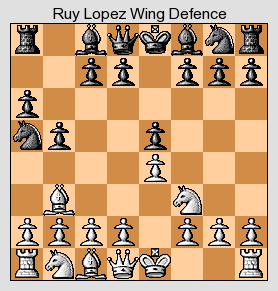 A situation in which a player is limited to moves that cost pieces or have a damaging positional effect or A situation in a chess game in which a player is forced to make an undesirable or disadvantageous move. Zugzwang Wikipedia Page - Good sized page on this topic with history and examples. 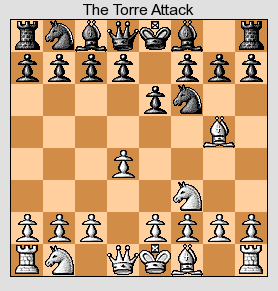 The Torre Attack Wikipedia Page - General Knowledge on this opening. The Norwegian Defence (also called the Wing Variation ), is an aggressive but time-consuming alternative for Black. The game follows 3...a6 4.Ba4 b5 5.Bb3 Na5. The goal of the opening is to eliminate the white bishop. A speculative sacrifice (Nightingale Gambit) is now 6.Bxf7+? !, which drives the black king out, but with accurate play, Black is supposed to be able to consolidate his extra piece. Just traveling through life one day at a time.